Hot on the heels of the latest BMW M3 saloon and M4 coupe, comes details of the M4 convertible. It will arrive here in September with a price tag of €108,300 (on-the-road ). 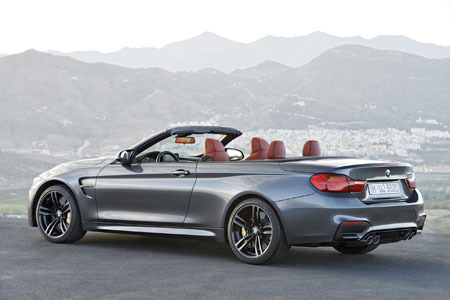 It will be the fifth-generation high-performance open-top car of its kind from the BMW’s M division. It will be powered by the same 431hp in-line six-cylinder engine as the M3 Saloon and M4 Coupé, but the Convertible offers the option of a six-speed manual or seven-speed M Double Clutch transmission. BMW says the M4 Convertible exhibits all the hallmarks of a car created by BMW’s high-performance specialists, lightweight engineering, carefully honed aerodynamics, advanced race-derived chassis tuning and electronic driver assistance technologies and a sporty elegant profile, open or closed. The BMW M4 convertible derives its firepower from a high-revving six-cylinder TwinPower Turbo engine which benefits from technologies developed on the race track. This 2,979cc in-line six-cylinder powerhouse, developed by BMW M, features two mono-scroll turbochargers, high-precision direct injection, Valvetronic fully variable valve timing and Double-Vanos variable camshaft control. And BMW says this technical prowess allows the M4 Convertible to switch seamlessly from an undemanding everyday road car to one which feels totally at home on the race track. It claims huge reserves of torque peaking at 550Nm are available from just 1,850rpm – exactly the point at which maximum power of 431hp is attained. This is then maintained until 7,300rpm. Maximum engine revolutions are 7,600rpm. All of this means the M4 Convertible delivers a seemingly never-ending surge from little more than engine tickover to the electronically restricted top speed of 155mph. The zero to 62 mph (100kmph ) sprint is achieved in 4.6 seconds with the six-speed manual gearbox, or 4.4 seconds with the seven-speed M Double Clutch Transmission. Such performance should come with a cost, but the combined mpg figure is 31.0 mpg (or 32.5 mpg for the M DCT transmission version. And the CO2 emissions is 213g/km or again 203g/km for the version fitted with M DCT transmission. BMW's M division says that such impressive performance calls for advanced, race-derived technologies, including special cooling systems. An indirect intercooler maximises charge pressure and engine output, while the main radiator is supplemented by other coolers located in the sides of the engine bay for the high and low-temperature water circuits as well as for the engine and transmission oil (with the M DCT gearbox ). An additional electric coolant pump helps to cool the turbocharger bearing mounts when the car comes to rest. The iconic quad exhaust system contains electronically controlled flaps which minimise back-pressure and the carmaker says it also ensures that the M4 convertible has an unmistakable BMW M sound. The optional seven-speed M Double Clutch Transmission (no price yet ) effectively combines two gearboxes, each with its own clutch. Shifts are therefore completed with no interference to the power delivery, enhancing both performance and efficiency. Gear shifting can be fully automatic or via the selector lever or steering column-mounted paddles. Drivelogic allows the driver to choose more sporting or more comfort-oriented shifting programmes while in automatic mode, and the seven-speed M DCT transmission also incorporates launch control to ensure the fastest-possible acceleration from standstill.